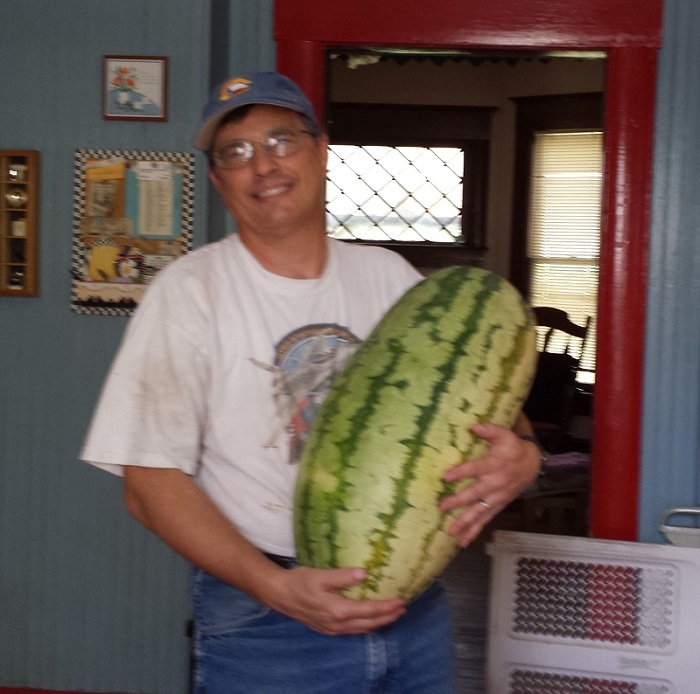 “Big Bertha” – August 9, 2014; Length – 27.25 inches; Circumference – 32.25 inches; Weight- 43 lbs. Back when Paul bought her, she was nothing more than a tiny little seedling. He cleared out the compost bin, planted it on one side, and then just kept watering for weeks and weeks and weeks (well, actually, Rebecca’s attendant, Miss Teresa, did most of the watering – she apparently likes to do that!). We kept watching….and watching…and watching…. 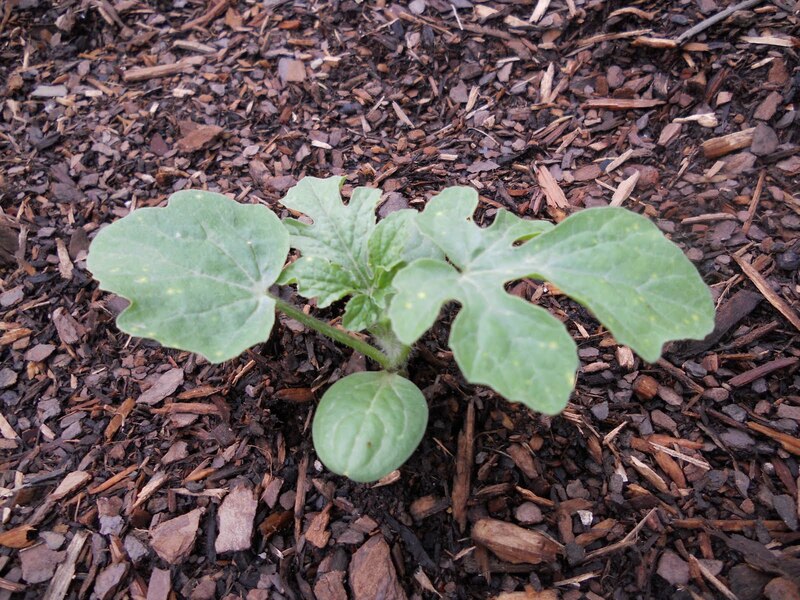 And the tiny little plant kept getting bigger….and bigger….and bigger…. 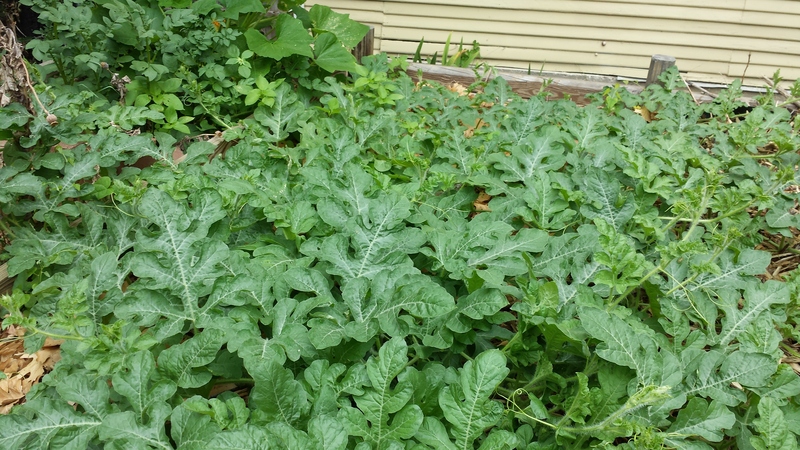 The plant that ate Fort Worth…. Having never grown these before, we weren’t really sure when it was going to be ready to pick. So we went online and found out what the “signs” are for a ripe one (brown tendrils and “spoon” leaf). Saturday afternoon, we decided to pull the trigger. Sucker took up the entire bottom shelf of the refrigerator…. I’m ready for my close-up, Mr. DeMille…. Paul nicknamed her “Big Bertha”, and she made her debut at a friend’s house on Sunday. We cut her open and had a feast. One half was consumed at the party, with plenty of leftovers sent home with anyone who wanted them. 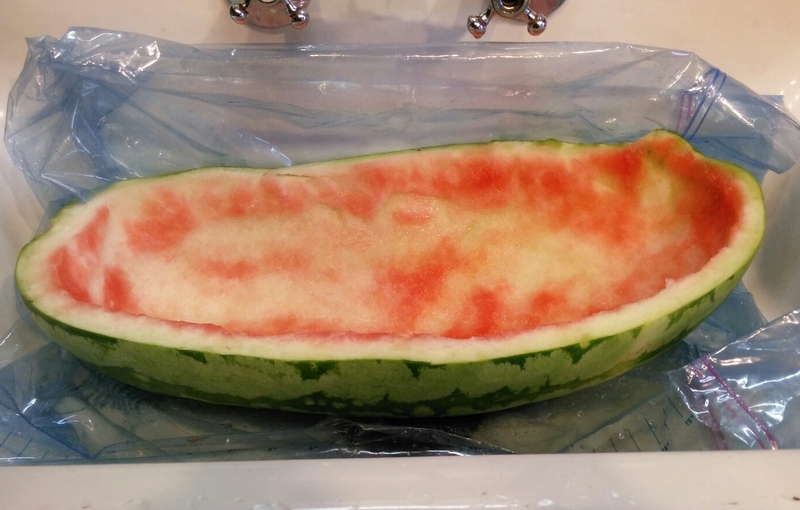 That left us with another full half of a watermelon to take home and deal with. She took up all of the sink, too…. This morning, I scooped out what was left and saved all of the fruit, pulp, and juice. We told Miss Teresa to take as much of it as she wanted – after all, she’s the one who helped Bertha grow! 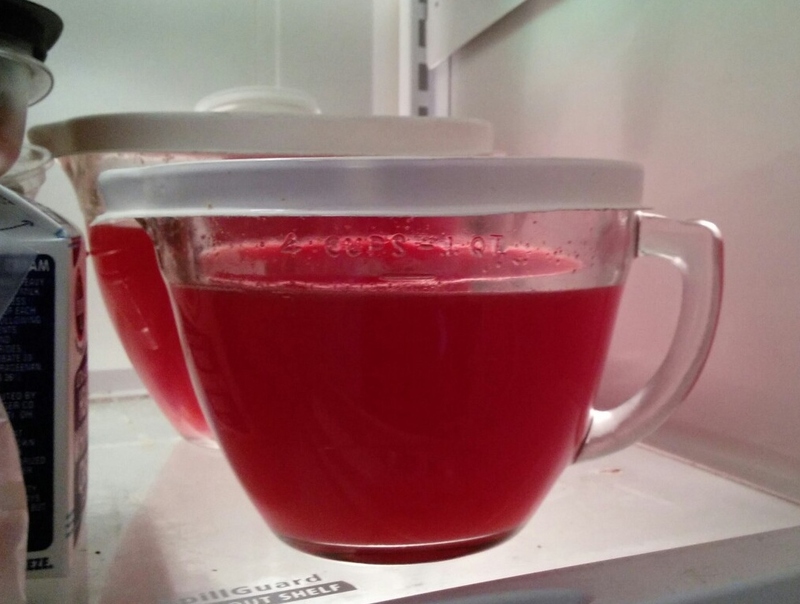 About 12-13 cups of fruit and pulp…. 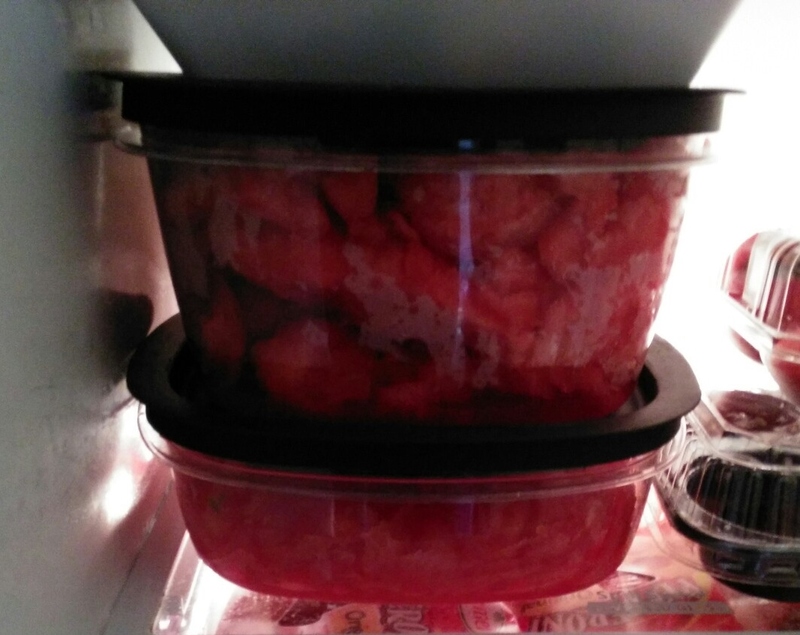 And now it’s off to pull out my recipes for popsicles, sorbets, granitas, etc., so that none of this sweet goodness goes to waste…. Nothing left but the shell…. 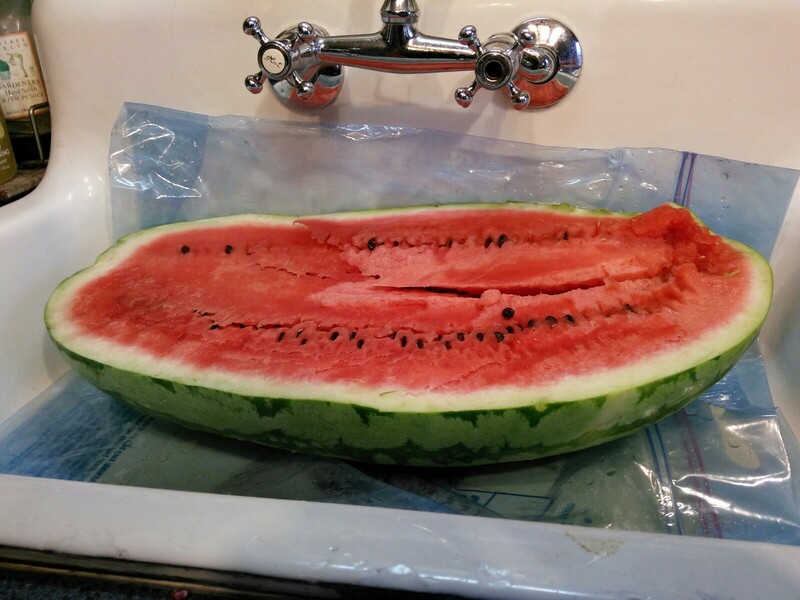 This entry was posted in House Stuff, Humor, The Geeks Shall Inherit the Earth and tagged Summer Gardening, Watermelon. Bookmark the permalink. 6 Responses to It’s a Bouncing Baby…. My garden produced zucchini that size one year, no kidding. A friend took one home and had to strap it into the passenger side care seat with a seat belt. I would have paid good money to see any cop’s face who dared to pull her over that day. 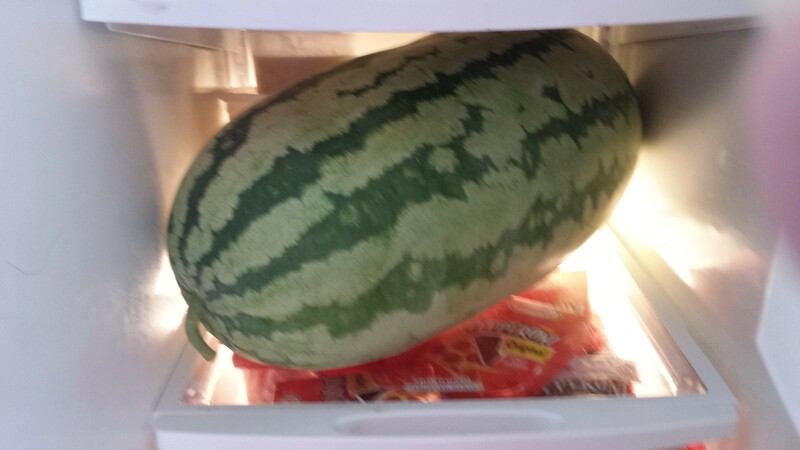 TiFW grows huge watermelon, riots erupt in StL. Coincidence? Maybe. Wish I had been there to enjoy the watermelon. Looked wonderful. Hope that the rest of your harvest is as successful.